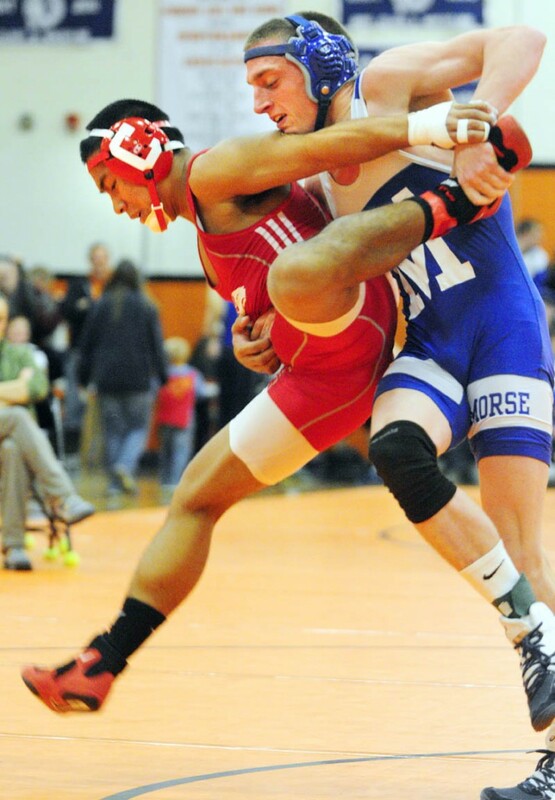 GARDINER -- The momentum over the final four matches Saturday at the Tiger Invitational wrestling tournament was on Cony's side of the floor, and it built with each succeeding victory. GARDINER — The momentum over the final four matches Saturday at the Tiger Invitational wrestling tournament was on Cony’s side of the floor, and it built with each succeeding victory. A decision in the championship finals by Cony sophomore Mikal Federici was followed by an improbable pin from sophomore Nic Benner, then came a quick pin by Cody Dular in the 220-pound division. The Rams secured their come-from-behind win when heavyweight Steven Morse pinned his opponent in 31 seconds in the consolation finals. The team rushed the floor, not quite sure if it had upset Mt. Blue. Moments later, the final score was confirmed giving the Rams a three-and-a-half point win against the favored Cougars. Westbrook took third followed by Erskine, Gardiner, Morse, Monmouth and Maine Central Institute. Morse senior Wyatt Brackett, who won at 152, was named the meet’s outstanding wrestler. An undermanned Mt. Blue squad led throughout the meet and appeared in good shape with eight wrestlers in the championship finals. The Cougars won four of those matches while the Rams won five of their six matches, three by pin. Cony, Mt. Blue and Skowhegan are among the favorites in Eastern Maine Class A this season. Mt. Blue returns a veteran team, not all of whom wrestled Saturday. The Cougars got wins from Tyler Craig (106), Khalil Newbill (120), Kevin Moore (126) and Zach Faulkner (160). Craig, a freshman, pinned Westbrook’s Andrew Rogers in 10 seconds. Newbill, who took third in the state at 112 last year, needed overtime to beat Morse’s Dylan Harrington 9-7. Cony graduated several wrestlers from a team that finished fourth in the state last year. Totman has prepared them with a strong early-season schedule that has included Camden Hills, Marshwood, Massabesic, Fryeburg and Mt. Blue. The Rams also got championship wins from Dufour, who decisioned Morse’s Gary Stevens 8-3, and Jake Charest who pinned Monmouth’s Alex Turbide at 113. Benner trailed Gardiner’s Mitchell Chesley 5-0 in second period of the championship match in the 195-pound division. He came to life at the urging of his coach and teammates. Gardiner fielded just six wrestlers, but four of them reached the finals, and another the consolation finals. Junior Dan Del Gallo, a defending state champion at 135 pounds, pinned Mt. Blue’s Drew Blanchet at 138 and is now five wins away from 100 for his career. Gardiner’s Wyatt Thornton won at 152 while Zac Abram (160) and Chesley (195) placed second and Hamish Thornton (220) third. Erskine, which won the tournament last year, graduated several of those wrestlers while two others are out with season-ending injuries. Cade Ayotte was the only Erskine wrestler to reach the finals where he lost to Federici at 182. Westbrook got a pair of wins. Graham Strondak held on to beat Mt. Blue’s Caleb Farrington 7-6 at 170 and Devon Grant decisioned MCI’s Jacob McGowan 3-1 in overtime in the heavyweight division. Monmouth placed one wrestlers, Turbide, in the finals, while Tyler Lewendowski (120) and Stewart Buzzell (138) placed third. Brackett defeated Cony’s Thon Itthipalakorn 2-1 in the 145-pound final. The Morse wrestler trailed 1-0 in the third period before scoring a reversal for the victory.